Looking back at early critics’ cold reception of the filmmaker’s seminal work. 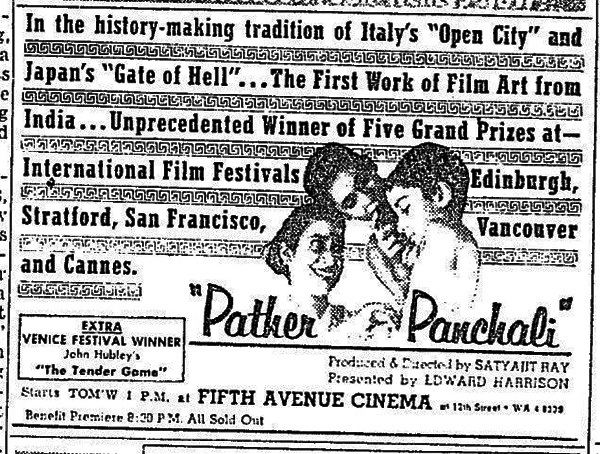 ‘The First Work of Film Art from India’ – advertisement for ‘Pather Panchali’ in New York Herald Tribune, 21 September 1958. All photos courtesy of the writer. The Bengali auteur’s influence is ever-present: Satyajit Ray is cited as a source of inspiration by living artists as diverse as Barry Jenkins, Martin Scorsese, Ava DuVernay, Shyam Benegal, Claire Denis, Teju Cole, J M Coetzee, Durga Chew-Bose and so on. Referring to contemporary Southasian filmmakers, actor and filmmaker Aparna Sen says, “We have inherited [Ray] as Ray had inherited Tagore.” He may be the most internationally recognised and celebrated name in Indian cinema – and unfortunately, the only name with which certain audiences and critics are familiar. At times, it is hard to banish the uncharitable suspicion that Ray is included in certain textbooks, lists, syllabi, and other common artefacts of film culture and criticism in a tokenistic manner, as shorthand for Southasian film history at large. In an essay for Criterion, entitled ‘The Apu Trilogy: Behind the Universal’, Girish Shambu reminds us that prior to a fascination with Bollywood, Western film viewers and critics associated Indian cinema synonymously with the films of Satyajit Ray. How did it happen, asks Shambu, that one filmmaker could “stand in for the cinematic output of the one of the most populous and diverse countries on the planet”? Early writings on Satyajit Ray ­– from what appear to be the first mentions of him in popular English-language print in 1957 to the commercial releases of his first two Apu films in the US and Britain in 1958 – delineate how and when the Bengali auteur, from being an upstart, becomes the filmic icon we recognise today. Contrary to narratives of Ray’s immediate and welcomed induction into the canon of world cinema – as recounted by certain scholars and admirers – we can trace the reception of Ray in Western film criticism as a surprisingly ambivalent encounter. These writings are sites of recurrent tropes, cultural biases, and other problematic discourses by which non-Western cinemas enter into the institutions and canons of a Western film audience. The earliest records we have of Ray in English-language print report his win at the 1957 Venice International Film Festival. The Los Angeles Times publishes what is perhaps the very first mention of Ray in the US: a short article, enmeshed within a wall of ads, entitled ‘India Takes Gold Lion’. If these articles are the earliest sources referencing Ray, then it is tempting to presume that he was widely celebrated from the outset of his career. Indeed, Andrew Robinson, author of the biography Satyajit Ray: The inner eye, makes this claim. Robinson cites the filmmaker’s win at Venice as the decisive moment in which Ray emerges as a titan of world cinema. However, things were not that simple. In fact, the Los Angeles Times article is not celebratory; it is one among many characterising Ray’s win as an upset. The audience in Venice, reports the article, responded to Ray with “mixed applause and booing.” In contrast to his “cold reception,” Luchino Visconti – the runner-up – received “thunderous applause.” What could explain these reactions at Venice? One could speculate there was shock value implicit in the notion that a first-time filmmaker from India could beat an old Italian master – in the home-field of Venice, no less. In other words, the city was a conducive setting for these kinds of reactions against Ray. Yet, the more we read about this incident, the more we realise further complexities in the story of Ray’s cold reception, whereby the hypothesis of home-team, nativist resentment simply does not explain all. In a more detailed article about Venice for Variety, senior American film critic Gene Moskowitz exhibits the same ambivalent, if not apathetic, attitude towards Ray. In his article, ‘The Paradox of Venice’, Moskowitz argues Venice – competing with Cannes – is ruining itself in trying to re-brand its festival as more cosmopolitan, more inclusive and more “international”. He laments at what he sees as the consequence of these reforms: a poorer quality of accepted entries. While he celebrates a few international films at the festival – namely, Kenji Mizoguchi’s and Akira Kurosawa’s dramas – he does not mention the winner of the festival, Satyajit Ray. We may assume, given his argument, that Ray may then be an example of the ruinous foreign influences entering the festival. It is interesting to also consider how Moskowitz was among the first critics to have seen Ray’s film in Cannes the year before. His silence is thus doubly curious: is Ray the example par excellence of Moskowitz’s criticisms or is it that Ray, even if he were the winner, simply did not appeal to Moskowitz. In this earliest wave of print-media reactions to Ray, there was one notable exception. Robert F Hawkins, writing for the New York Times, uncharacteristically defends Ray’s win in a retrospective article published two weeks after the festival. But Hawkins, too, testifies to the “controversial” nature of the win and “divided opinions” on it. Complicating biographer Andrew Robinson’s claim that Venice established Ray, these articles describe a rather cold reception. Controversy, resentment, bias and the politics of internationalised film spaces – these critical elements are lost in Robinson’s and others’ accounts of Ray’s immediate induction into the filmic canon. By 1958, there was an increasing standardisation in the language used by critics to talk about Ray. He becomes the subject of a common body of thought, writing and vocabulary among Western film critics while his films are defined as ethnographic spectacles. And Ray’s films were characterised by either their universal or exotic qualities. Almost all critics of Ray, be they overt or indirect in their phrasing, participated in this discourse. Ray-related print begin to be longer and singularly focused on Ray, and start to include commercial and paratextual-visual supplements (eg, theatre information, photographs related to Ray and ‘Pather Panchali’). Even the greatest champions of Ray represented him as not quite a full auteur or artistic agent. Instead, Ray’s genius lay in his ability to capture an ethnographic portrait of Indian village life – or as the Spectator in 1958 asserted, “The Real India”. This may explain why Pather Panchali won a bizarre award at the 1956 Cannes: ‘Best Human Document’, an improvised award, which was never given to a film before or since. What made Pather Panchali, in a way no other feature had Cannes’ history, a ‘human document’? Granted, Ray’s grounded and observational style of filmmaking – influenced by Italian neorealism – may potentially lend itself to the interpretation of documentary or ethnography. However, it would be strange if there were a parallel discursive tradition among film critics characterising De Sica and Rossellini, not as auteurs, but as exotic ethnographers. What makes this trope curious is that it is not applied to Ray as a way of devaluing his work. On the contrary, early champions of Ray – including Hawkins – invoked it in celebratory terms. Hawkins states that Ray’s “direct yet poetic observation of the human scene recalls the best work done… by Flaherty.” This parallel with Robert Flaherty, director of the seminal yet controversial ‘documentary’ Nanook of the North, is another prominent trope in the early discourse on Ray. So confirms the American writer John Updike, by placing the fictional Pather Panchali “in the great tradition of documentary carved out… by our own Bob Flaherty.” This analogy with Flaherty was so prevalent and self-evident to early critics that, in 1958, the annual Vermont retrospective on Flaherty invited Ray to lecture. 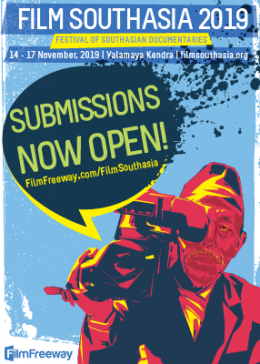 What were these strange yet familiar films from India? 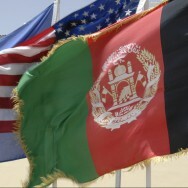 Were they universal or exotic to us? 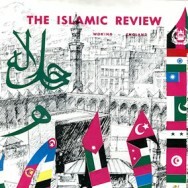 Certain texts – including commercial movie bulletins like those published by Monthly Film Bulletin – praise Ray’s films for their “striking quality [of] universality”. Similarly, Ray’s films are described as human, humane and/or humanistic to the same effect. While we may certainly hold these traits to be a part of Ray’s films, the commercial and critical proliferation of these descriptions warrant us to consider why these traits are prominently stated instead of others. While this is not denied of Ray’s films, it is curious how ‘universality’ functions as the ubiquitous, if not the hegemonic, lens through which his work is seen. Similar appeals to the universal and humane dominate descriptions of other non-Western filmmakers, from Yasujirō Ozu to Abbas Kiarostami. Meanwhile, what is forgotten is that Ray is nonetheless a filmmaker who engages with culturally specific subjects and traditions. As much as Ray sought, in his own words, “to portray universal feelings,” this trope does not leave space to consider how Ray is himself a product of – and artistic agent within – a particular cultural history. 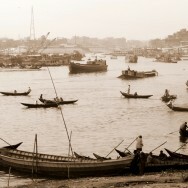 Consider that many of his films were adaptations of Bibhutibhushan Bandyopadhyay and Rabindranath Tagore, or his use of Ravi Shankar’s music and the supposed raga structure of some of his films, or the ways in which Ray’s own unique artistic, social, familial, gender, class, caste and political identities are enmeshed, consciously or unconsciously, in his films. Universality as a standard paradigm for how we conceptualise Ray (and other non-Western filmmakers) is then a reductive and exclusionary trope, in which certain qualities of a filmmaker’s work become undermined or lost in translation. Crowther goes on to claim that Ray’s film would have barely passed a “rough cut” within Hollywood. This indicates that for critics like Crowther, non-Western film forms – of those ‘underdeveloped’ and ‘exotic’ lands – are marching teleologically toward the apogee of Hollywood classicism. Contrary to the narratives of Satyajit Ray’s instantaneous and loving canonisation, even when he stood front and centre in the spotlight of Western film criticism in 1958 –– Ray was still a figure subject to contentious, racialised and, to be sure, bizarre remarks. ~Mahdi Chowdhury is a graduate of History from the University of Toronto and a Master’s candidate at the University of Cambridge. Had he not chosen to pursue graduate studies, he would most likely be watching movies all day. RE: David Lelyveld’s comment — Many thanks for reading my article and for your astute comment, Dr. Lelyveld. 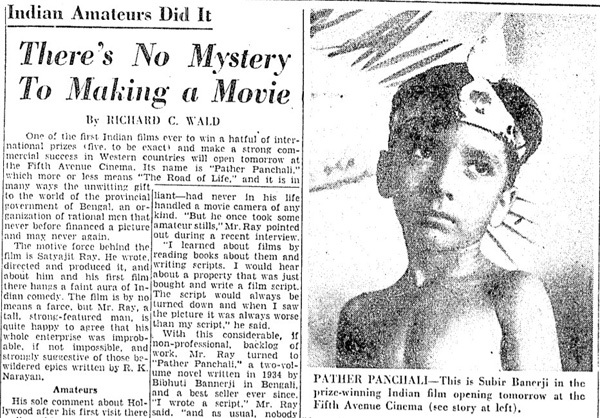 In April 1955, what would be ‘Pather Panchali’ partially premiers in the MoMA as “The Story of Apu and Durja” (as you mention, it was introduced to its curators and exhibited also as still photographs.) This version was partial, screened without subtitles, and I am led to believe from primary sources, without (or at the very least without Ravi Shankar’s) music. I omitted this New York episode to make this article more concise — but given how it was screened, it supports our belief that “no indication [was made] that it was from a fictional film.” As I have argued, a major source of interest in Ray spawned – not from the consideration of him as an auteur or artistic agent per say – but in his ability to capture ethnographic/documentary vistas of Indian village life (Monroe Wheeler, who was, in effect, responsible for the 1955 screening of Ray, describes it foremost as “a triumph of sensitive photography”). In 1955, before Pathar Pancali was shown in the US, a still photo from the film was included in the Family of Man exhibit at the Museum of Modern Art in New York — with no indication that it was from a fictional film.